This section provides information on discontinued products from Control Equipment. Although these products are no longer available for sale, they are still being supported by technical services and support. If you are currently using a product which has been discontinued, and you would like to learn more about products that have superseded old models please contact us online. 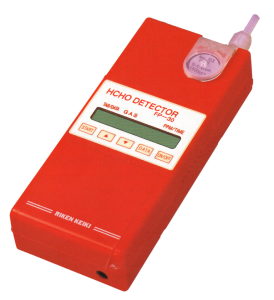 Used for the detection of formaldehyde, this highly sensitive portable gas detector uses a photoelectric photometry method with colorimetric detection tab. The FP-40 has a direct readout of measurement value on an LCD display and provides a reading to 0.6 ppm in 3 minutes. This hand held instrument has a built in high sample drawing fan and high sensitivity semi-conductor gas sensor. There are 4 versions which are designed to detect and trace leaking sources of flon, methyl bromide, ammonia and hydrocarbons. The new Laser Methane mini (LMm) is capable of remotely detecting methane and other gases containing methane (natural gas or similar). It can quickly detect gas leaks or accumulated gas from a remote place by pointing a laser beam at the target, and is even able to detect a leak through glass. 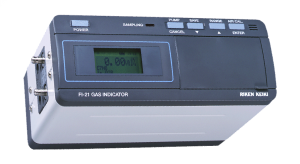 The FI-21 is a precision gas analyser which is adapted to measure the % volume concentration of any of the commonly used gas in a mixture of air or oxygen for solvents, fumigation, gas purity and anaesthetic gas. The FI-21 is often upgraded to include any new concentrations which may be introduced in specialist fields. Sulfuryl fluoride (SO2F2) for example is now included as standard in the fumigation unit.